Outdoor pool season is here! In greater Seattle (and beyond), that means wave pools, simulated surfing pools, lazy rivers, zero-depth (beach-like) pool entries, aquatic play structures, and slides, slides and more slides. We’ve compiled a hot list of outdoor pools and water parks worth a visit this summer. And one tip: Heated outdoor pools are a great destination on cool, cloudy days, too, and bonus, you'll find fewer crowds. For more summer water fun, read our Seattle and Eastside area spray parks guide and our South Sound spray parks guide. Did we miss a great pool? Let us know in the comments. Overview: Overlooking the beach in lovely Lincoln Park in West Seattle, this Olympic-size saltwater pool was recently renovated and upgraded. It features a diving board and corkscrew tube slide. Pool toys like water noodles and mats are available, too. Important note: There is not a wading area for tots. Tips: Colman is a popular swim destination that sells out on hot days. Come early to purchase your swim admission. This facility requires admission for anyone entering the facility, even if not swimming. Deep water swim test required for all those under 18. Modified swim test allowed with personal flotation device (life jacket). Note: Pool visitors need to make a short stroll through Lincoln Park to reach the pool. 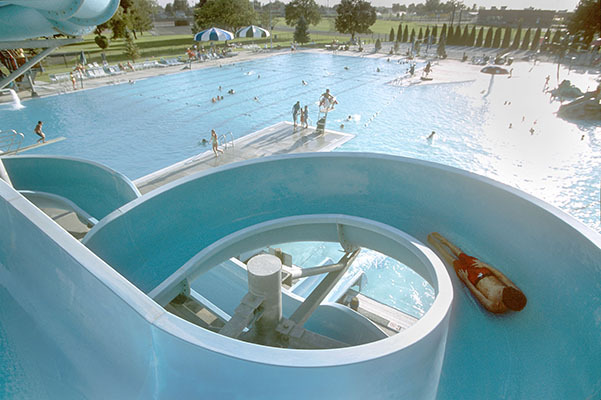 Overview: Mounger is actually two pools: a larger, deeper pool, with a 50-foot corkscrew tube slide, and a separate warmer-water, shallow pool for young kids. For tots: Check out ”Pool Playland,” a “gentle” public swim (daily from 11 a.m.–noon) that takes place in the small, warm water pool only, and is for children 5 years and younger. An adult, 18 years or older, must accompany all children in the water. Water noodles and other toys are available during Pool Playland, Family Swims, and Fun Family Friday sessions. You may also bring your own toys at the lifeguard’s discretion. Tips: This pool is also very popular and sells out on hot days, so come early. Family Fun Fridays feature games, activities and a different theme weekly. Look for “Free Slide Day.” Check Mounger's Facebook page for updates. Mounger Pool recently installed a fixed shade structure. Prices: $3.75–$5.50; $1 slide fee (in addition to admission). You can also purchase a 10–visit pass for $33.50 youth/senior, $50 adult. Overview: Set in one of Edmonds' loveliest, shadiest parks, this popular pool, run by the YMCA, features a diving area with diving board and a hot tub (for ages 6 and older). Enjoy their Family Swim which is limited to kids 8 and younger (with their parents) on Saturdays and Sundays from 10 a.m.–none. Note: There is not a separate shallow area for toddlers. Tips: For families of 4 to 6 make sure to get the Family Day Pass or consider an 11-visit family pass for $250 or family season pass for $625. Yost Park is also worth exploring, with shady forest trails, a creek, basketball court and a playground. Prices: Youth $6; adult $7; family (4–6 members) $25. Eleven-punch pass for family (4–6 members) $250; 11–punch pass youth $70; adult $80. If you’re a resident of Edmonds or a Dale Turner Family YMCA member, you’ll receive a discount on fees. Overview: Kids love the Water Walk, slide, inner tubes, water basketball hoops and diving board. Other amenities include a BBQ on deck for picnics and new sound system. For tots: The shallow end of the pool (depth of 2.5 feet) is designated the “Preschool Zone” and is only for kids 48 inches and under with adult supervision. Tips: Plan to arrive 20 minutes prior to your session opening on hot days. After swimming, spend the day at McCollum Park and bring a picnic or a bike for the trails. Prices: $5 per person per 75-minute session, ages 2 and under free. 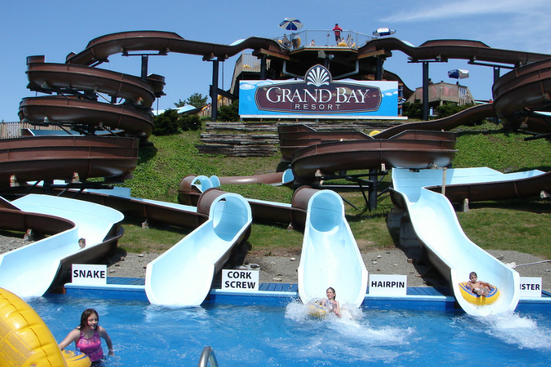 10–visit punch card: $40; individual season pass: $80, household season pass: $215. 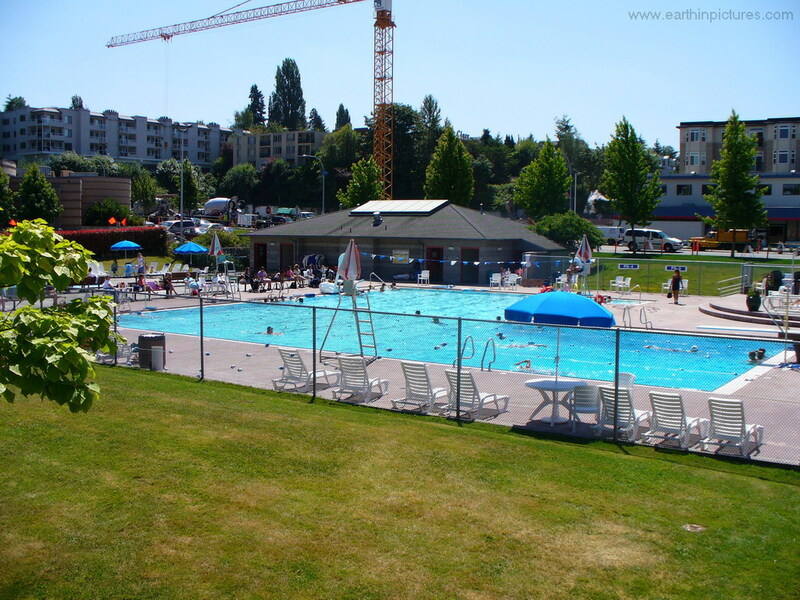 Overview: Located in the heart of downtown Kirkland, this large, L-shaped pool features a deep area with a low diving board that bigger kids will enjoy. For tots: A separate wading pool for young kids is open during all public swims, and there are special “wading-pool only” sessions for kids under 7 and their caregivers. Prices: $5 per person per session or 10-visit pass $45. For a family of swimmers, check out the Household Unlimited Pass for $290 (includes 2 named adults and named dependent children). Open: Outdoor pool open May – Sept.
Water temp: Outdoor pool: 79–81 degrees. Indoor pool: 84–86 degrees. Overview: Samena is an indoor/outdoor pool with a diving board outdoors, and indoor events monthly. For tots: There is a wading area in the outdoor pool that's open when outside temperature is 72-plus degrees. Tips: The least crowded times are family swim (only open to members). Prices: Membership required: Non-members can take swimming lessons. Members get discounted lessons and access to Family Swim. Call 425-746-1160 x113 for membership rates. Dual family and single parent family rate options available. Overview: Prepare yourself for lots of water excitement with the 26-feet high orange-and-blue water slides, the lazy river, wave machine and island lagoon. Shark Bites Cafe offers beverages and snacks. Back by popular demand this year is the twilight swim every Friday from 6:30–8:30 p.m. For tots: There is zero-depth entry to a water play structure, toddler water area, and numerous spray features. Tips: Pre-sale admission begins at 9 a.m. for two open-swim sessions. Session one is 11 a.m.–2 p.m. and the second from 3–6 p.m. The second session of the day is usually less crowded. Water toys are not allowed during leisure swim sessions. Call 425-430-6719 to check on pool closures. Prices: This is a public pool, cheaper for residents; find rates here. Full session $4.50–$8.50/residents; $8.50–$15/non-residents. Babies 1 and under are free. If you plan to go often, look into a season pass: $60+ tax resident/$120+ tax non-resident. The pass guarantees entry on all days. 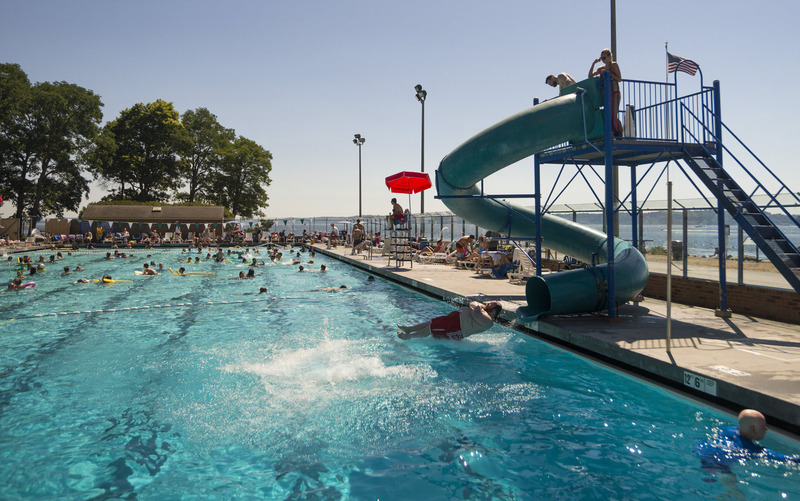 Overview: This addition to Tacoma's public outdoor pools features a gradual zero-depth entry, a 100-gallon tumble bucket (fills up then dumps when full) and Pierce County’s first “Wave Pool,” which simulates an ocean wave experience. For tots: Little ones will enjoy the separate shallow pool and “sprayground” that sits adjacent to the main pool. Tips: There are limited tables and chairs, so get there early if you’d like a lounge chair, or bring your own. Visitors can likewise bring their own food and beverages but no glass containers are allowed. Concessions are also available. Prices: Full session $9/$11; half/evening session $5/$9; tots (ages 0–4) free. Season passes: $75 for first pass; $70 for additional. 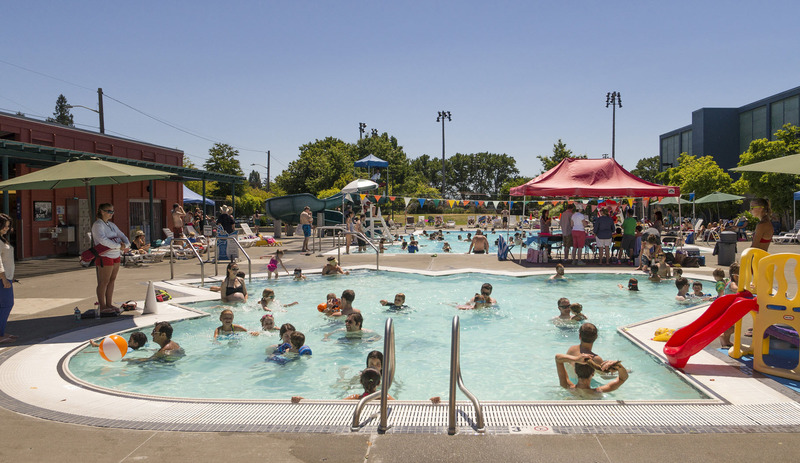 Swim passes are good for both Kandle and Stewart Heights pools. Overview: Another popular outdoor public pool in Tacoma, Stewart Heights features a 160-foot water slide, lazy river, bubble pool (looks like a hot tub but pool temp), water basketball hoops and tumble buckets. For tots: There is a zero-depth entry area. Tips: There are limited tables and chairs, so get there early if you’d like a lounge chair or bring your own. Visitors can likewise bring their own food and beverages but no glass containers allowed. Concessions available also. Prices: Full session $9/$11; half/evening session $5/$9. Season passes cost $75 for first pass, $70 for additional. Swim passes are good for both Kandle and Stewart Heights Pools. Overview: Against the stunning backdrop of an old sandstone quarry, this 82-foot-deep freshwater pool promises the ultimate deep-water experience. 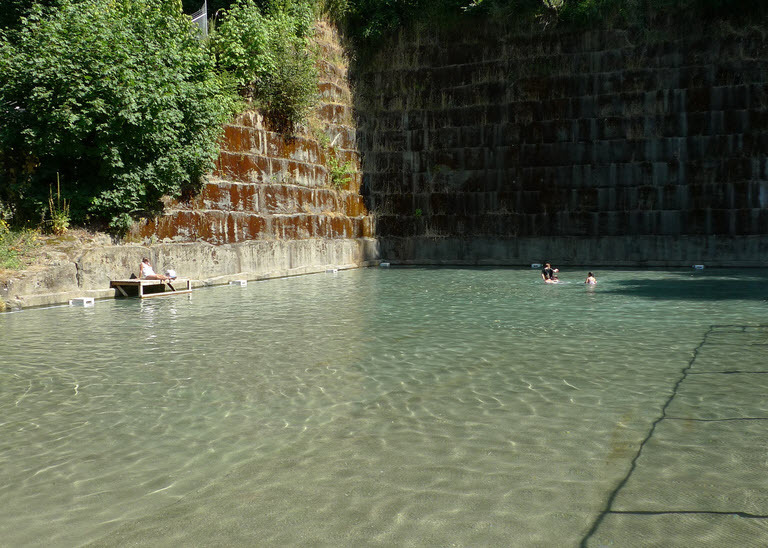 Kids can bounce off of two diving boards and swim to a waterfall that flows into the quarry. The downside of all that deepness is that the water is cold. Plan this adventure for very hot days. For tots: There is also a slightly warmer wading pool for young kids. Tips: Kids under 18 have to pass a swim test before entering the deep pool. Train-crazy kids will also enjoy visiting the old train depot next door (made of sandstone). It's open weekends. There are also trails in the park. Prices: $5 day pass for non-residents of Tenino; $200 family season pass (2 adults & 3 children). Residents $3 day pass; $125 family season pass. Overview: Swimmers will love the huge tube slide, diving board and water toys. On dry land they have the Snack Shack, foosball, ping-pong, and tennis courts next door. Tips: You must take a ferry to visit Vashon so consider making a day of it; check out this article on day-tripping to Vashon. Prices: $7 per person or 10-visit pass $55.25; tots free (ages 3 and under). Water temp: Varies among the different attractions. Tips: Weekdays in June are less crowded. It is definitely recommended to bring your own stroller, as they don’t provide rentals and the park is 70 acres. Rent your own cabana 24 hours in advance. Prices: Through June 30, price is $16.99 (cost reflects a discount for online purchase); from July–Sept. $22.99–$32.99 (discount for online purchase). Day passes are good for admission to both Wild Waves and Enchanted Village. Kids 3 and under free; parking $10–$20. One admission ticket provides access to everything except two paid thrill attractions. Deals: It pays to purchase online (but do it before you are at the park because discount tickets are not available for purchase via mobile devices if you are within park property). Other deals include group tickets and season passes available. Season pass prices increase as the season progresses so buy early to save: May $64.99, June $69.99, July–Sept. $79.99. Surf n Slide is known as clean, affordable and toddler-friendly with zero-depth beach entry to the pool, a children’s splash pad with a variety of spray fountains, plus a Treasure Island water play structure and baby octopus slide. 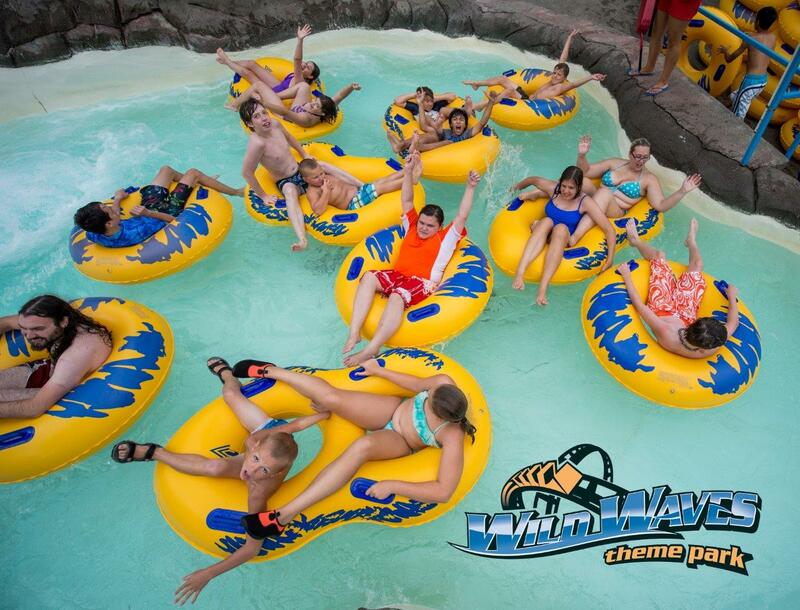 Kids and teens interested in more exciting water play will love the Flowrider (surfing simulator, one of only a few in the region), 200-foot slides and sand volleyball courts. Tips: Use a season pass or punch card to enter via VIP entrance to bypass the line. Eat at the Hang Ten Grill or bring your own coolers or picnic basket (no glass containers, tobacco or alcohol allowed). Prices: Daily pass: Tots free (4 and under), $12–$13 youth/senior/adults. A punch card (10 punches) is perfect for large groups and families because you can punch multiple people on one card: $115 for ages 5-17 and seniors, $125 for ages 18–64. Season Passes: multiple options available depending on size of family. Check website. 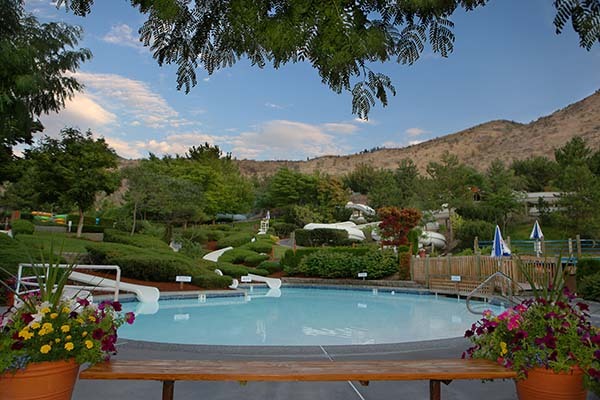 Overview: If you're headed to the Chelan area for a summer getaway, don't miss this fun, family-sized water park that takes advantage of the natural topography for its slides (it's built on the side of a hill). Rides and attractions range from the Bug-a-boo slide and Aqua Zoo for toddlers to intermediate slides and the lazy river ride for older kids to the Thunder Rapids and enclosed pitch black slide for the ultimate thrill-seekers. There's even a 60-person hot tub. For tots: There is a zero-depth wading and Aqua Zoo activity pool by the Lazy River. Tips: Tuesdays tend to be a little slower than the rest of the week and the best times to come are late June or the last week of August. Note: Any goggles or sunglasses must have a strap for the sides. Prices: Daily pass: $20–$25; free 2 and under; discounts for "PM Plunge," three hours before close Take advantage of free re-admittance — come and go all day long with a stamp on your hand. 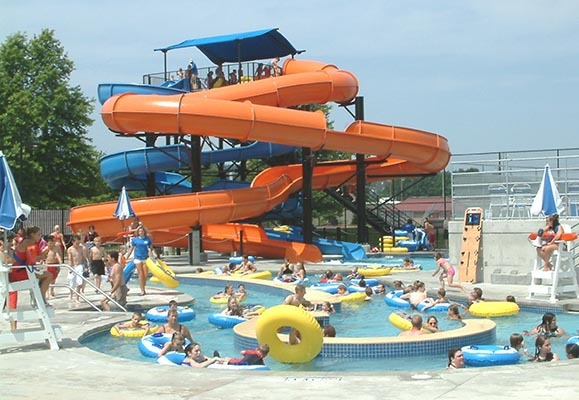 Overview: Enjoy the two diving boards, Frog Slide (tiny slide), Lily Pads (rope ladder across pool inner tubes), tube slide, water basketball hoops, dry playground, concessions stand and covered areas with grills that can be rented. For tots: Little ones can ease into the pool with the zero-depth entry section of the leisure pool; and the tiny Frog Slide is a perfect beginner slide for young kids under four feet tall. Tips: Since temperatures get into the 90s and 100s in Ephrata, bring lots of sunscreen and water, then seek shade under the giant umbrellas or nearby trees. Feel free to bring outside food and drink but no glass containers or alcohol. Come and go as needed with unlimited daily in-and-out privileges. 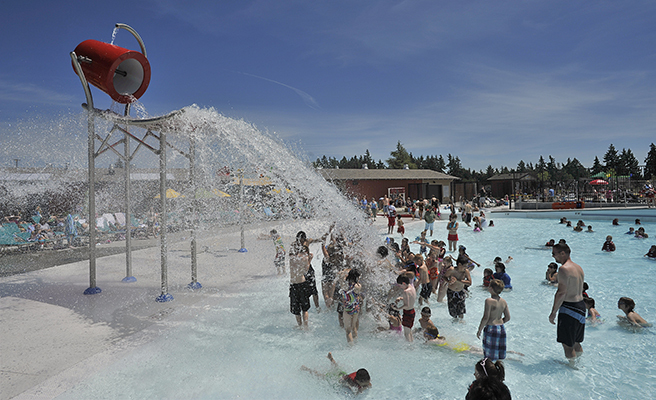 Overview: Just south of the Canadian border, near Birch Bay State Park, find this family-friendly water park with nine slides, a 40-person hot tub (you must be 7 or older), kiddie pool, volleyball, basketball and activity pool. Concession stand. The black slides include the Black Hole and a slide with a 60-foot drop (kids must be at least 12 years old and 100 lbs. to go on the drop). For tots: The kiddie pool, for ages 8 and under, has three slides. Tips: Check online for special deals. Reserve a covered spot online. Outside food is allowed but no competitors food (all fast food and pizza prohibited). No coolers, alcohol or glass allowed. Prices: $13.00–$22.50 for full day. $11–$17.50 for “late day” after 3 p.m.
Editor's note: ParentMap staff contributed to this article, which was originally published in 2013 and updated for 2018.